It's easy! All you need is two pieces of 8 1/2" x 11" construction paper. Cut one page down to 7" x 11", and the second page to 5" x 11". Fold the first page with two flaps of 2" each, one flap facing forward and one flap facing backwards. This page is the back and the bottom. Fold the second page with two flaps of 2" each, both facing the same way, backward. This is the front and sides. Tape the front and sides to the back and bottom. Print out Hedgie's artwork. Color the artwork and add your name. 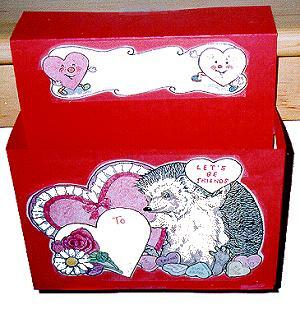 Tape the artwork to Hedgie's Mailbox and tape the top flap to your desk. Happy Valentine's Day from Hedgie and Jan Brett!